On Tuesday morning, I woke up early to the terrible news that my grandmother had died. If you’ve been reading along for a while, you’ve heard about Gram – here and here. She was a spunky character with a wicked sense of humor and a warm heart. She did not suffer fools lightly and she didn’t know how to say no to her grandchildren. When we were little, she sewed our Easter dresses, threatening to put bricks on our heads to stop us growing between the time of first measurements and the finished outfits. For Christmas she made the only fruitcake I would ever eat. It was moist and full of pecans. She fried her legendary chicken well into her eighties, despite assuring us all that she would quit when she reached that milestone because, and I’ll be honest, we begged. It seems like just a few years ago, my cousin Simone and I coerced her into one more frying session, just so we could take notes and watch every step. I don’t know about Simone, but I still cannot match that chicken. It seems so normal today with our ubiquitous music from every device but Gram was the first person I remember ever listening to music on the radio as she worked in the kitchen. I can’t hear the classic that starts, “Good morning, star shine” and continues something like “Dooby ooby walla, dooby abba dabba. Early morning singing song,” without hearing her voice, singing along, stirring a roux or probably with chicken sizzling in the huge Magnalite roaster she used for frying. Lid on, just barely cracked. It occurs to me writing this that Gram, being born in 1913, was just a few years older than I am now, and listening to pop songs from the musical Hair. No wonder she never seemed old to me, despite having natural white hair since she was in her thirties. Even my other grandmother called her “the fun one” with just a little envy. I went to visit her just a few weeks ago in the nursing home we had to call a rehab center because she refused to live in a nursing home. She had fallen and broken her femur, endured surgery to repair the damage and was doing 100 minutes of physiotherapy a day, preparing to go home. I walked in the second morning and she was in the physio room. The therapist told her to show me what she could do and I’ll be doggone if my 99 1/2 year old grandmother didn’t bend right over and touch the ground! My aunt was already busy organizing her 100th birthday party in December and, last I had heard, Gram was going to be released this Friday. Then suddenly, she was gone. In between looking for last minute seats on airplanes, I baked this cake the day I left Dubai for her funeral. And since it calls for Champagne, we lifted a glass to Gram. She was never a drinker but I think she would have appreciated the gesture. We didn’t get to celebrate your 100th birthday, Gram, but I can assure you that we will celebrate your life, your love of family and the joy of good food cooked in a happy kitchen, leaning always on your good example. Preheat your oven to 350°F or 180°C and prepare your Bundt pan by buttering it liberally and then shaking a couple of tablespoons of flour in it to coat. Set aside. Peel your peaches and dice two. Puree the other two with a hand blender. I chose to use white peaches for the puree since traditional bellinis were made with white peaches but, really, you can use all yellow, if that’s what you have. Sift your flour, baking soda, baking powder and salt into a bowl and set aside. In the bowl of your mixer, cream the butter and sugar until yellow and fluffy. Add the eggs one at time, beating well in between. Add half of the flour and mix again. Now add half of the yogurt and half of the peach puree. Mix again. Add the rest of the flour and mix and then the rest of the yogurt and peach puree. And, you guessed it, mix. Finally, fold in the Champagne. Pour the batter in your prepared pan and bake for 55-65 minutes or until a toothpick inserted comes out clean. Meanwhile, mix the Champagne one teaspoon at a time into the powdered sugar, until it is of good drizzling consistency. I ended up using three teaspoons. When the Bundt is baked, let it cool for 15 or 20 minutes and then turn it out onto a wire rack and allow to cool completely. Once the cake is cool, drizzle with the glaze. I like to use a decorating bag with a tiny icing tip for prettier lines. Serve with the rest of the bottle of the Champagne. Craving more Bundt cakes with peaches? Have a look at all of the other wonderful peachy Bundts the Bundt-a-month group has baked for you today. Join us in the month of August by adding your peachy Bundt to the linky tool below. This is my August blog post choice for Fab First Fridays, hosted by Fiona of London-Unattached, where we share our favorite post from the previous month. Head on over and share yours! So sorry for your loss, Stacy. She sounded very spunky and to live to be almost 100-amazing. Your cake is just divine and a lovely tribute to her. Thank you, Lora. She was a remarkable woman and will be deeply missed. I'm so sorry for your loss, but what a wonderful tribute. That cake looks delicious! My condolences to you and your family Stacy. Your gram sounds like a very special person, and I am sure you will keep her memory alive through music and cooking. My prayers and wishes. So sorry for you loss. Sounds like your Gram had an amazing life. 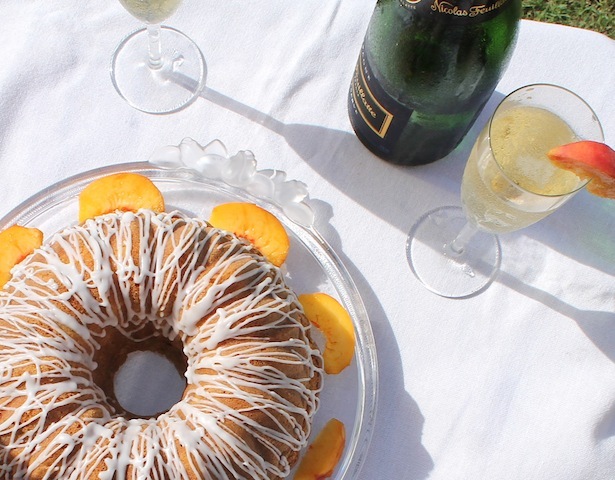 A Bellini Bundt is a great idea! G'day! So sorry for your loss, true! Your cake is a great tribute to your wonderful gram too! Oh Stacy, what wonderful memories of your grandmother. Growing up she must have seemed so spunky and ageless to you. And I'm sure your heart was filled with her love when you baked this beautiful cake. (You sure know how to make a simple bundt elegant!). I am so sorry for your loss and I wish you and your family peace and comfort in the days to come. I'm so so so sorry to hear about your grandmother!! She sounds like she was an amazing woman and I'm sure you'll all cherish in your memories for years to come. This cake is so beautiful! A unique cake for a wonderful grandmother. She sounds amazing, and celebrating her life is the best way to remember her Stacy! I almost didn't bake at all, Paula. My heart was so heavy. But then I would have just sat around that day, working myself up, so baking was better and more of a tribute than moping. My grandmother never let anything stop her. She was a fabulous example of "You can do it!" Thank you for your kind words. I am sure that Rocket will adore you forever. You are just the kind of grandmother mine was and the kind I hope to be. Love you too, Kelli. Thank you, Joanne. She was amazing and will be missed very much. Thank you, Holly. She lived a good long life. Not many folks get to make 99 years and see the changes in the world she has seen. Thank you for your kind words. Thank you so much, Anne. Gram was a live wire who was still climbing up on the kitchen counters to reach the high cupboards in her eighties. There was nothing she couldn't do, as far as she was concerned. Such a good example of how to keep living life! Thank you, Joanne. I love that beautiful poem by James Whitcomb Riley. I know she is home now and at peace. Thank you, Sandra. I was quite enamored of the bellini idea myself, another reason I decided just to continue with my baking plan that day. Gram had quite a sweet tooth and would have liked this cake. Thank you so much, Jenni. I remember when we got to know each other over that fig preserve post. My cousins and I were reminiscing over the last couple of days and I could write reams more about our experiences with Gram. She was indeed one in a million. Thank you, Lisa. I appreciate your kind words. That cake is stunning and worthy of this post. My deepest condolences on your loss but your grandmother sounds like a woman who lived a full life and deserves to be toasted with champagne, peaches and cake! I LOVE bellini's! This cake is so fun. I'd love to share it at a brunch along with bellini's. Thank you, Anita. The loss is easier to bear, knowing that she had a good long life full of joy and close family. I did debate whether to make bellinis to serve along side the cake, Heather, but then plain Champagne won out. The cake was sweet enough! So sorry for your loss Stacy. Such a shame she did not make it to her 100th birthday. You bundt is wonderful and I do like that champagne glaze. Another reason to pop the bubbly (as if I really need one). I had no idea how the Champagne glaze would taste, as it was just an experiment, but it was lovely, almost lemony. Thank you, Laura. I thought about what i would write as I baked and the words just poured out. I could have given you a couple of more pages. :) Gram was that much of a character. The funeral was beautiful! Thank you so much for your kind words. I love peaches. I love bellinis. I love white sticky drizzle. I love bundt cakes. Score! This is an amazing cake for sure. I am in love with it and the beautiful summery pictures. Wonderful! I'm so sorry for you loss Stacy. What a wonderful tribute to your grandmother. Your words were so moving and what a lovely gesture this beautiful cake is indeed. The flavors you chose sound delightful. Stacy, what a nice tribute to your grandmother. So sorry for your loss. Thank you, Misty. You know what a character she was. I guess we thought she'd live forever. It was so weird to be in New Iberia without ANY of our grandparents. Love you! Thank you, Liz. She was the best role model for all the things that count. It was a blessing to have for as long as we did, for sure. Thank you, Christine. I took the photos in Dubai so it was hotter than the hinges of hell. But at least the garden is still green since the sprinklers come on to water three times a day! Thank you, Kate. The cake was already in the planning but baking that day made me feel better. I think Gram would have liked it. She had a real sweet tooth. What a lovely tribute to your grandmother - and a fitting bundt to celebrate her life. HUGS. Your gram sounds awesome. And I love the champagne in the cake. Thank you, Nancy. I think she would have loved it. That would be a very good day in the kitchen, Simone! Nothing would delight me more than attempting to replicate Gram's fried chicken with you. Thank you for sharing Gram's words with me. I can hear her saying that in the same tone she used to say to me, "That Simone's so smart!" It was such fun to spend time together with you and your brothers again, even under the circumstances.